Can I Get Social Security Benefits Through My Spouse? Can I Get Spousal Social Security Benefits? Question: Can I Get Spousal Social Security Benefits? Whether or not you have worked during your lifetime and earned Social Security, you may qualify for benefits on a spouse's record. This is the case even if you are divorced or widowed. As with regular Social Security benefits, you will qualify to begin at age 62 (you may qualify earlier for survivor benefits, which is explained below). Typically, the amount you receive is reduced the earlier you start collecting before full retirement age. That is why deciding when you and your spouse should begin to apply for your benefits matters. Here is more information on how it works. 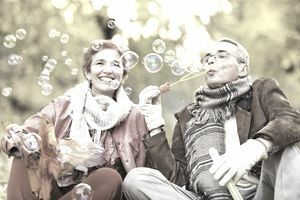 If you did not work enough in your life to qualify for Social Security benefits on your own, you could get one half of your spouse's full retirement benefit once you reach full retirement age, and you will qualify for your spouse's Medicare at age 65. This spousal benefit is in addition to their benefit and does not affect the amount your spouse will actually receive. If you worked and earned your own Social Security credits in your lifetime, you can get a combination of your own benefits and spousal benefits. If your spouse's benefits are higher than your own, your benefits will readjust to the higher amount. Spouses can strategically coordinate when to claim Social Security in order to maximize the benefits you receive as a couple. For example, let's assume you were to start receiving Social Security at age 62. You will not get the full amount of your own benefits, but you can increase the amount you receive if you qualify for spousal benefits. Alternatively, you could wait. Once you reach full retirement age and are eligible to receive your own retirement benefits as well as a spousal benefit, you can request to have your own payments suspended until age 70 and earn delayed retirement credits (or your spouse can choose this option instead). This will increase the amount of the your benefits payment at age 70. If you were married to the same spouse for 10 years or longer and that person worked enough to qualify for Social Security, you can receive benefits on the ex-spouse's record even if he or she is remarried. To qualify, you must be unmarried. If you remarried, you do not qualify for benefits from the first spouse unless the subsequent marriage ends and you have been divorced for at least two years. If your spouse has died, and you remarry after you reach age 60, your survivor benefits are unaffected. A widow or widower receives something called survivor benefits from Social Security. The rules are similar to other spousal benefits but survivor benefits can begin as early as age 60. Of course, as with other benefits, your benefits are reduced if you begin collecting before full retirement age. If you are a divorced widow or widower, the rules are similar. However, if you remarry before age 60, you cannot receive survivor benefits while married. If you remarry after age 60, you can qualify to receive survivor benefits. These benefits are complex, so it's best to discuss them with a Social Security representative. When you, your spouse or your ex-spouse apply for benefits, the system will make note of your eligibility for benefits as a spouse. You do not need to make a separate request. Even if your spouse or ex-spouse has reached the eligible age for benefits but has not applied, you can start collecting benefits on his or her record. But if you have questions about whether you qualify as a spouse, you can visit your local Social Security office or call 1-800-772-1213. When Can I Apply for Social Security Retirement Benefits? Can I Get Social Security if I'm Working? Disclaimer: The content on this site is provided for information and discussion purposes only. It is not intended to be professional financial advice and should not be the sole basis for your investment or tax planning decisions. Under no circumstances does this information represent a recommendation to buy or sell securities. Do You Know Your Full Retirement Age According to Social Security?